Dad is tucking Daisy up in bed – well actually, he’s in bed too and yawning. He says to her, ‘If I were you, I’d snuggle down and go to sleep.’ Daisy, who looks wide awake, takes this literally and they begin to talk about what would happen if Dad were Daisy and Daisy were Dad. Daisy would read Dad a bedtime story, and Dad would wake up first in the morning and go and bounce on Daisy’s bed. Daisy would dress Dad in a pink tutu and give him porridge for breakfast while she had chocolate fromage frais. Dad would have a lazy time watching television and playing while Daisy did the housework. This sounds good to Dad, but he’s not sure about being taken for a walk in a pushchair wearing that pink tutu – what on earth would the neighbours think? Dad and Daisy would go to the park, but Daisy realises she wouldn’t be strong enough to give Dad a piggyback. Dad could have a great time having tea with his friends and playing games, after which Daisy would have to give him a bath. The whole story comes full circle when Daisy says she would tuck Dad up in bed and give him a big kiss. Dad thinks that a day without household chores would be fantastic, but Daisy of course realises that she is better off being herself. After all this thinking, Daisy finally drifts off to sleep and Dad can creep off and relax. 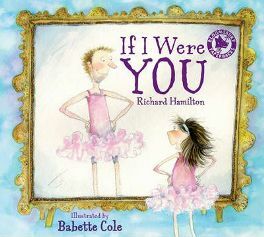 Richard Hamilton has created a fascinating tale based on the reversal of roles in ‘If I were you‘. It is an ideal opportunity for plenty of humour, especially when they consider the idea of Dad wearing a ballet tutu. There is no mention of Mum in the story except when Daisy suggests Dad could have tea with his friends. Mum is there with Baby, so it seems that in this family Dad gets to do all the chores and look after Daisy most of the time. Dad and Daisy do seem to have a loving and friendly relationship. Hamilton uses rhyming couplets in each situation that the pair imagine; this is an ideal way to develop a young child’s feel for rhyme and love of language. Babette Cole’s illustrations make a huge contribution to this picture book. She knows exactly how to portray the humour in each situation, showing Dad with a few spiky hairs on his legs and a six-o’clock shadow when he wears the pink tutu. There are a couple of pages showing Daisy and Dad at the zoo, running along with monkeys in one of them. Here Dad, still in the tutu, clasps a bunch of colourful balloons while Daisy holds an ice cream out to him. When they are playing musical chairs after tea, we see Daisy’s blue kangaroo and a pig joining in. Further down the page Dad (in his tutu, of course) gets down on all fours, Daisy balances on his back and they chase after the three bears. Dad has fun spitting out a jet of water while he’s having his bath, but doesn’t seem to appreciate Daisy shampooing his hair. One of the bears joins him in the bath whereas the cat dashes off at the sight of all the bubbles. The text is set in quite a large font, and there aren’t usually more than two or three lines per page. It isn’t always in straight lines, however; sometimes it curves up and down, or individual words appear to jump around when Dad is bouncing on Daisy’s bed. Single words are sometimes set in a larger font for emphasis. The text is always printed on a light-coloured background, so there will not be any problems deciphering it. This is definitely a read-aloud book rather than one for a child learning to read. I can imagine that a child of about seven who is a confident reader might enjoy reading it to a younger brother and sister, especially since there is so much humour throughout the book. I have read this aloud to a group to children aged three and a half to four, who were about the right age to follow the idea of role reversal and appreciate the humour. I’m not sure that two-year-olds would quite understand the concept of the book, but they might still get some fun out of the illustrations. Richard Hamilton has come up with an original idea for a picture book here, and I cannot think of anyone who would have provided more appropriate illustrations than Babette Cole. This is a book that can be enjoyed by the adult reading aloud as well as the child being read too. I am sure that it will appeal to many families, and I certainly recommend it. No Comments on "If I Were You"